As you know windows XP isn't came with an inbuilt tool for capturing screenshots of the entire screen as it appears in windows 7. Snipping tool make it easy to capture screen shots of the computer screen so you can save it as an image. A snapshot can be taken in case you're facing some problems in your computer and asking for some help from your friends or elders so you can take screen shot to let they see what error-message comes to you. Snipping tool comes handy also for technical writers, bloggers etc. 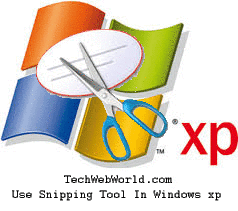 As you know the snipping tool is introduced in windows 7 which wasn't available in windows XP but if you're a windows xp's user and want to use it in your operating system i.e xp then here is a step-by-step guide for you to follow in order to capture screenshots of your entire computer screen using the snipping tool of windows 7. Step-1: Here we'll be making use of a little and free tool called "Windows XP snipping tool" by the Codeplex. So first of all, download it from this LINK and follow the instructions below. Step-2: Download the file from that link and click on setup.exe file within the downloaded zip file. But also make sure that you've .Net framework version 4.5 installed on your machine to make this application work properly. Step-3: So install the application on your pc. you can see the camera icon on the tray icon at the taskbar after installing this application on your computer. You've to right click and select 'capture' option in order to take screenshot in windows xp. It has the features included just that are in case of windows 7. i.e cropping, re-sizing, copy to clip-board etc. You can use it very easily just as you ever used in windows 7.